Weather : The sun made a rare appearance during the game, and it snowed as well - crazy but true. Customer Service : Excellent Pies and Peas. No need to say any more. Founded in 1880, Whitby are one of the oldest clubs from the North Riding area of Yorkshire. The club has spent its entire history in the amateur leagues, though they have reached the second of the FA Cup on two occasions seasons 83/84 and 85/86. Losing to a last minute Wigan penalty in 83/84. 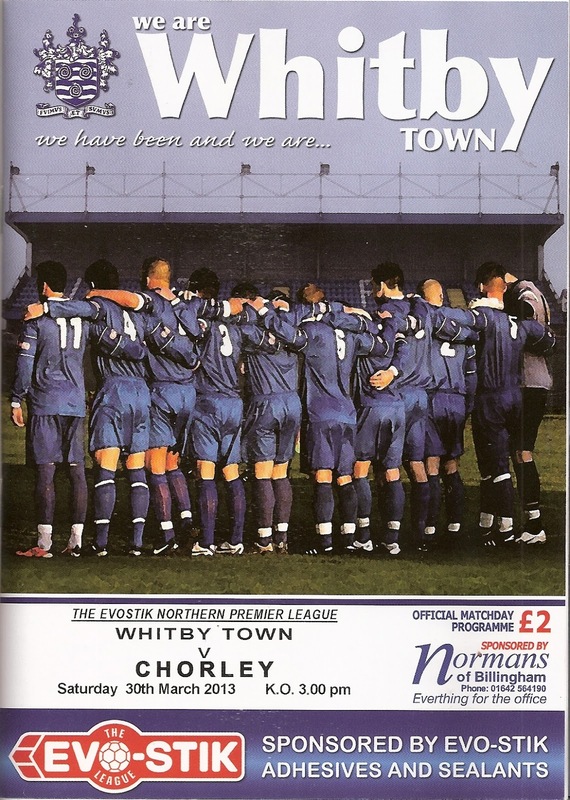 Whitby's most prestigious claim to fame is arguably their FA Vase victory against North Ferribly Utd in the 1996/7 season at Wembley Stadium. Whitby play their home games at the 3,500 capacity Turnbull ground on the oddly named Upgang Lane. Their club colours are somewhat distinct in English Football and are intentionally similar to Italian side Sampdoria - a blue base for the shirt with a touch of vertical white, black and red stripes . The Whitby Hotel is in the foreground. Rather grand looking, isn't readers? From what I can gather, the houses in the background have been divided up into eight self contained flats and are the market at the princely sum of £5 each - who said the property market in the South East is a licence to print money? Another decent crowd for this one. The locals are not feed very often at Whitby. A fine view of the moors in the back ground. The rather regal looking building in the corner is the Whitby Hotel...every get that feeling of de ja vu? It all happens in the centre of Whitby. Or does it??? Whitby's impressive main stand which was opened on the 29th March 2006. The stand was funded in part from local fund raising events and a £150,000 grant from the Football Foundation. Does this make the ground a business/non business asset ? Not always, it depends on the use of the building. Meet Sammy Seagull he is number one in the "pecking order" when it comes to Whitby fans. 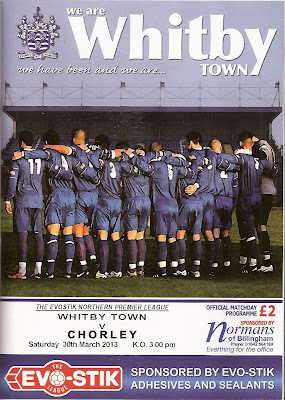 One of Whitby's greatest moments was a FA Trophy quarter final game against the "Cocker knees" from Ford Motor Co aka Dagenham FC. There's a nice "Spanners" hat and scarf here for you Oaksey. You will be able to blend in nicely at Romford market now. More fine cuisine at Whitby - Pie, mushy peas and mint sauce. The mint sauce is very avant-garde. Now it's time for a break from the football, no trip to Whitby would be complete without a visit to the fishing harbour as well. On the top of the hill, is the abbey where Dracula stayed when he's ship run a ground on the shores of Whitby during a fierce tempest. All of the crew are missing, presumed dead, and only one body is found, that of the captain tied to the ship's helm. Come the summer, he will be able to get a job at the local blood bank. It will be thirsty work but he has the "fangs" for it they tell me! Looks like he just popped out his "musuem" for a visit to his local shops - unlike yours truly he never looks his best during daylight hours. A visit to Whitby would not be complete without some Fish and Chips - would it now readers? At the chippy we were lucky enough to meet Graeme "Europe's No 1 hopper" enjoying his supper. Graeme has completed 3,053 games and 1,394 grounds (Correct at time of going to press) - now that's what you call a true labour of love. Btw he is an Evertonian, so it could be an excuse to avoid watching the "Toffees" on a weekly basis - you would not want to be "stuck" with that would you ? P.s. According to Graeme the Magpie&Ale chippy was not bombed during the war, the magpies stole the silver instead. For a change,we will end on a traquail note this week readers.